NaNoWriMo in April! Yes…it’s true! Q: It’s 1:40pm…do I know where my children are? A: Generally, yes. Both rode their bikes into town to visit the library…Roman’s probably playing Realm of the Mad God, while Jordi is likely watching over his shoulder! Hmm. Irony noted, as I prompt you all to discover the “technology-heavy” opportunities offered by NaNoWriMo! NaNoWriMo stands for National Novel Writing Month…and if you, like me, used to think it stood for National November Writing Month, I imagine we’re in good company…because, that’s when NaNoWriMo happens! In November! Or…does it? But first…just imagine…hundreds of thousands of people (or is it millions now? )…all aiming for the same, wacky, perfect, wonderful goal of…writing a 50,000 word novel in one month! Generally from scratch, no less. But honestly…what then? (Note…read this next section as fast as you can…it’s funnier that way!) Wait a whole year for the next insanely optimistic – struggle to get any writing done with a belly full of Thanksgiving Turkey or Tofurkey (hmmm…there’s probably a story in that…) – watch your tracking chart bump and flatline and leap up again and flatline…again…aaaauuuggghhhhh! And don’t forget the agony of trying to figure out HOW a writer is supposed to figure out HOW to upload their precious story so they can be “confirmed at their wordcount” and win the coveted “NaNoWriMo Winner” award!!!!! Um, I think they change the color of your name or something…anyway, that whole techie experience is truly the only bad thing about the entire process! And you get your long-wanted novel down on paper or harddrive or into “the cloud” or whatever. You get the idea. Now you don’t have to! 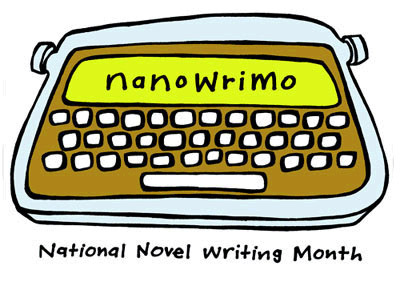 As of Monday, April 1st…(and no, this isn’t a joke)…they have launched CAMP NaNoWriMo! As in…let’s get that darn rewrite done, folks! So. What are you waiting for? There’s a story inside of you…and likely, you’re already 50,000 words into the rough draft! What could be more fun than diving in and tweaking it, and twisting it, and thickening it…it’s like making gravy. Raw ingredients aren’t enough…it’s time to simmer, add the cornstarch, and maybe some salt and pepper…or, if you’re a raw vegan, take those raw ingredients and blend them into the perfect dehydrated seed burger! PreviousTo ripen, or not to ripen…is not actually a fair question, is it? NextA Slice of Synopsis Pie? Hey, March! Ah, I never even thought to do rewrite in the context of NaNoWriMo. Okay, I'm diving in … even though it's 4/3 and I have a bunch of stuff making it difficult to rewrite for the next week. On the other hand, I want to rewrite my book. What am I waiting for :-)? Hi Jane! I agree completely…and here's the deal. You get to set your own word count goal in Camp NaNoWriMo…so, if you only want to do 25,000 words, you can! Isn't that cool?